“Will you marry me?” Sammy asked with a smile so wide I could see his back teeth. There was no nervousness in him, no indication that it was coming. Just good conversation turned down-on-one-knee. Instantly I was leaning down, grabbing him by the face and planting my M.A.C. Red lips all over his. You think about the day you’ll find your person, they day you’ll get engaged, the day you’ll get married. You don’t have the slightest idea it’ll be THIS MUCH FUN! That it’ll feel THIS special. December 11, 2014 was just another Thursday. I threw on black pants and heels that morning and headed to the salon for a ten hour day. We had dinner plans that night that I almost kind of dreaded because frankly I couldn’t wait to get home, throw my hair up in a messy bun, wash my face, and costume change into some Lulu. But we had a commitment, and I wouldn’t bail on my girl. Lindsey is a creative lover of life whose passion projects from behind the lens. She is a food and lifestyle photographer, but most importantly one of the most amazing people in my life. The week prior, Lindsey asked Sammy and I if we would be a part of one of her restaurant shoots. She said she just needed shots of our hands eating dessert at the end of a Bavette’s dinner. Bavette’s is my favorite restaurant, so of course we were excited to help out. Sammy met me at the salon and we walked over to dinner together. When we arrived, our favorite hightop in the back corner was reserved. Complete with two glasses of Malbec. Lindsey came to our table within minutes and explained that we could order whatever we wanted for dinner, and she only needed to shoot the dessert portion. She said she had to go back to the kitchen to shoot some entrees, and that she’d be back once our dessert came out. Nothing was out of the norm to me. I didn’t question the authenticity of the situation at ALL. Linds and I are always working on projects together, this was no big deal. Dinner was fantastic. Conversation even better. Simple, normal, “How was your day?” and “Did you see who the Nats traded?”. After dinner, two tooprettytoeat desserts came out. Followed by Lindsey, ready for the shoot. She arranged the spoons and our hands and took some ariel shots of the food. Signature @eatprayphoto shots. That was weird, I expected only our hands to be in the shots, but I shook it off. I felt like I stepped into a sauna. Instantly hot all over. I knew. The restaurant burst into applaud and strangers were recording the moment. I wish I’d have asked them to send it to me! Bavette’s gifted us champagne and I’m pretty sure I drank it in one gulp! 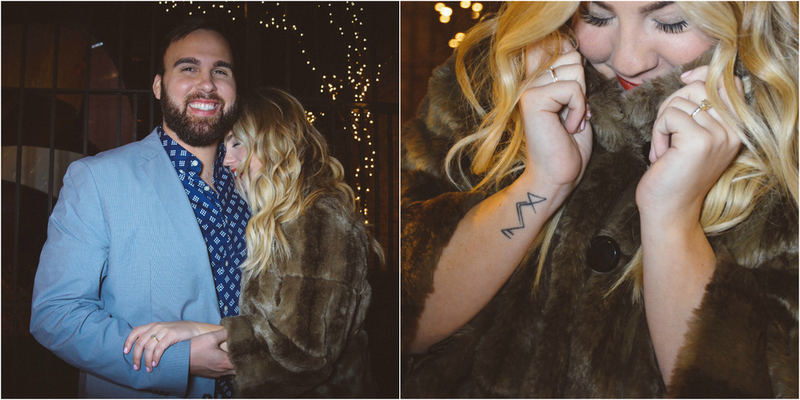 Needless to say there was no dessert shoot, Sammy asked Lindsey to document our proposal at my favorite restaurant. I still can’t believe I had no idea. I couldn’t wait to get out of there and call our families! I only had one bite of dessert, grabbed my coat and we headed home. Sammy secretly recorded me calling our families in the taxi home. Watching the video I realize what an absolute spaz I was that night! We walked into our apartment and I saw balloons and gold rose petals. Then a LOT of champagne, and a huge banner that said #WelcomeToThePalace. Then two by two, starting with my sister and her boyfriend, some of our closest friends started pouring out of our bedroom. I was still in shock from the proposal, and all I could do was cry to see our friends gathered together to celebrate this new adventure. Thank you to everyone who was involved in such a magical night, and to Sammy Palace, for making me feel like the most special girl in the whole entire world.